The rocket would keep same descent system as now (no parachute). But instead of landing on feet, it would have long grid fins on its top that would be catched by an elevated cable net. The previous spaceX attempts showed that the landing position is very precise, but that it's hard to land slowly and stable enough to avoid falling on its side or break a leg. This solution objective would solve this issue, plus reduce the rocket weight. The global idea is to transfer as much as possible the landing system (and its weight) from the rocket to the ground. No parachutes, keep the current advantages of controlled descend targeting a precise and optimal position in the sea. Cannot fall after landing or break a leg anymore. The long top grid fins would help stabilize the descent, and slow down a little the rocket (opposite of the current bottom legs that makes it harder to control). The landing impact force would be absorbed by the elasticity of the fin (and the whole plaform on water) on several meters ; much longer than the current brutal impact on feet. So the rocket could land with a higher speed, more fuel saving. So, surely there must be flaws and issues with this idea... waiting for your opinion and ideas! EDIT: Top-view of the net below. Metal structure would be 50m wide (same as the current landing platform), the net hole 15m of diameter, and top legs 15m length, so it cannot fall through the hole nor be in contact with the solid structure. Rocket precision to enter the net hole: the hole would be 15m of diameter, and the target precision of spaceX is 10m, so it should be already OK.
Net would burn/melt from the rocket fire: as seen in the point above, flames should not touch the cables - and cables should be quite resistant to them anyway. I think a lot of the weight of the current legs come from the huge hydrolic cylinders required to open the legs against the air friction (not the case for that in top-legs). Also they need to be very strong to support the instant landing impact, that would be smoothed by the net elasticity. We can also imagine some "legs" a bit different: if the structure is high enough, it could be some hooks that catch the net, not horizontall by at 45° vertically, and so take all the force mostly in tension and not compression, more like cables and so very resistant for a very low weight. Movement of the barge that would make the top of the net very unstable. Good point. Bug the barge is very big (50*90m) so quite stable, and we could add very heavy and deep keel (not sure of the word) to stabilize it more, as it doesn't need to move fast at this time (it may already be the case). The net would break if rocket would come too fast. Absolutely, but the rocket would still slow down to almost 0 like now. It would just have a little more flexibilty, could come slightly faster or less straight. You've made the legs twice as long (the real ones are about 7 m), which means they're at least twice as heavy. Probably more, since the load will be applied further out so the legs need to be stronger. So far from saving weight, you've just added several tons to the empty weight of the stage. The legs are at the bottom of the stage, conveniently located where the stage already has to be strongest to withstand the loads from the engines. The bottom hinges are attached to the Octaweb engine frame. The top hinge has a compression load, which is easy enough to engineer for (a band of thicker skin is enough). Due to the leg geometry, the load is spread between the bottom and top hinges. When you move the legs to the top, you have to strengthen the stage at the top, where you don't already have a strong structure inside. When the legs are straight out, the top hinges won't take any load so all of it has to be absorbed by the lower hinge. The lower hinge will be pulling outwards with a force of several tons, so you need to strengthen the skin here. The top of the stage is made to support weight in the vertical direction, not to support large horizontal loads. you don't save any weight, because you still need legs that can support the stage, you've just moved them from the bottom to the top. you need to strengthen the top of the stage, which adds weight. You still have the failure mode of 'a leg breaks after landing' or 'a leg fails to lock into position', because you're using a very similar mechanism. The hydraulic cylinders are still there: this time they're not pushing against the wind, they're preventing the wind from snapping the legs back violently. Longer legs = greater aerodynamic forces, so again more weight to prevent stuff from breaking. A net is inherently less resistant to the rocket's flames than a slab of asphalt on top of a slab of steel. The net also creates point loads where a cable meets the landing leg. As the rocket settles in the net, it will tend to move around. The leg will slide over the cables, which will abrade the legs (steel cable is a decent saw blade). The barge moves in the water, rocking on the waves. 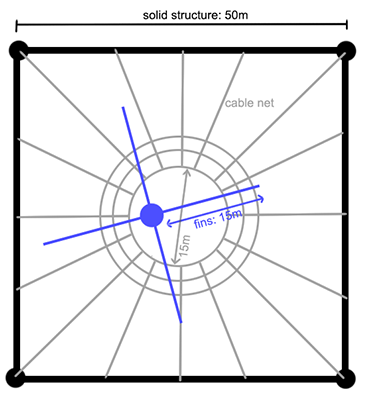 Any movement is amplified by the height of the poles that hold up the net: a few degrees of tilt ends up putting the poles several m out of place. This makes the hole a moving target that's much harder to hit than the barge itself. The hoverslam maneuver aims to get the rocket's vertical speed to 0 at the moment of touchdown. Catching the rocket while it still has some vertical speed increases the loads on the rocket. 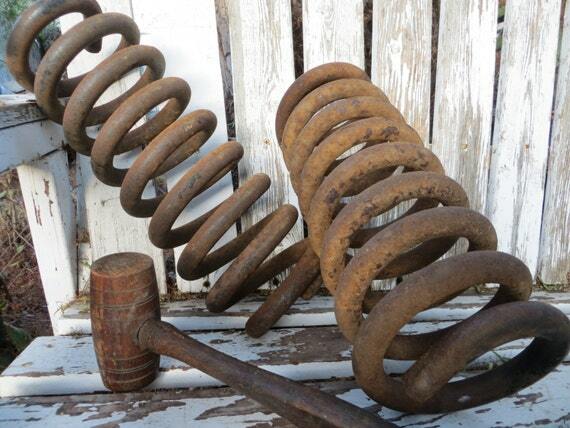 So you have to make the legs stronger and heavier again. When the stage uses its main engine to maneuver, the engine gimbals, spewing a ten-meter column of flame in a large off-vertical angle. It's possible to build a platform that's not affected by wave motion. You can add a large underwater structure that provides the buoyancy. Offshore drilling rigs are sometimes built like this. This would make the barge far less mobile, and 10x heavier (=10x more expensive) than it is now. To get flexibility in the landing, it'd be easier to replace the current leg design with one that doesn't lock, and adds some shock absorption to the hydraulic system. This requires more complex, heavier hydraulics though. And another thing: what happens after the landing? In the current design, the crew (presumably) comes aboard and welds some clamps over the legs to secure the rocket for the return voyage. Simple. In your scenario, the rocket's dangling from a net. It'll have to be secured, and pretty quick, or it'll bang into something and be destroyed. You can't lower it vertically (no legs at the bottom), so you'll have to devise a complex mechanism to set it down horizontally on a cradle. Issue #1: the rocket body is really thin (like a soda can) and the smallest force in the direction the net would apply would probably dent it. The first 3 just needed fixing the specific problem and the 4th attempt was a test of upper limits anyway. Issue #3: the net and surrounding structures would have to withstand rocket exhausts of 1 or even 3 (supposedly in the 4th attempt) engines. Issue #4: SpaceX is training for Mars and you won't have such benefits there. You're using way too high speeds to make it feasible, similar to a water landing (you could say, why not "dive" into the water). At the speeds a rocket touches down, if not heavily controlled, hitting a net is equal to hitting the ground/water surface. So the landing legs (which anchor to the net) need to withstand the full force, AND dissipate all kinetic energy, without creating a high momentum. So what makes this "easier" than a ground landing according to you? The net needs to have a very high yielding strength to withstand those forces. But not only that: either the net needs to be really flexible, or the landing anchors simply need to withstand the same forces as a ground landing. A high yield strength, highly ductile material (low Young's modulus) that can be created of large enough size simply does not exist yet. Sure, theoretical materials such as graphene might prove useful in the future, but if you allow that, why not make the whole rocket from that material? Now there is also an actual drawback to using a net compared to a landing on land such as the Soyuz do. (This is similar to why water landings are so much harder to both air and spacecraft). Land is well defined structure, you know its shape and it's (probably) nicely flat. A net (and sea) are not that way, they deform (waves) and are nearly never flat. 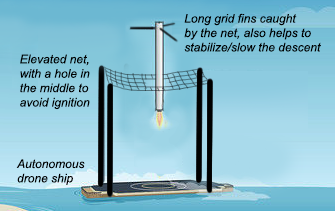 This effect is, in a net, exaggerated by the workings of netted structures: you never land perfectly, so one part of the rocket will touch the net first, this creates a wave which will actually create an upward force at other parts that are landing. Try simulating the last part. Not the answer you're looking for? Browse other questions tagged spacex falcon-9 landing reuse first-stage or ask your own question. Is there some reason why ORBs don't land in a cylindrical cage? Why not land booster stages in a cone or net? How can Falcon 9 first stage land vertical in a strong wind?